Welcome to Wiremo! 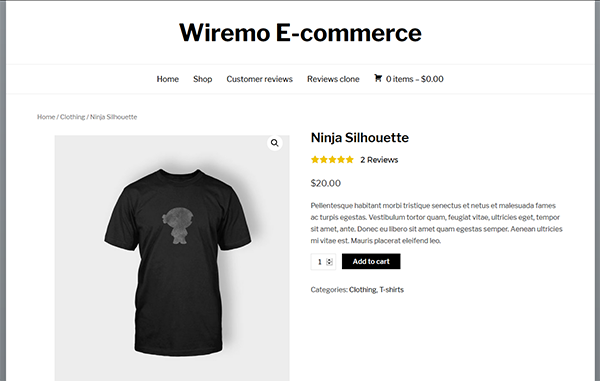 Below we will explain you how to setup and use Wiremo plugin for WooCommerce. It's easy as pie. The whole process can be divided in 2 parts: Setup and Customization. Setup Wiremo plugin for WooCommerce. 1. Go to your WordPress Dashboard and click on plugins then press Add New. 2. 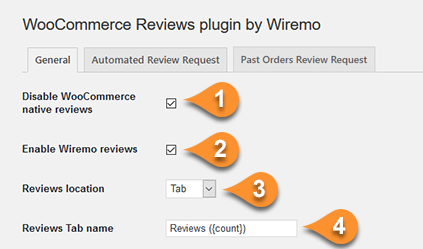 In the search box, type "WooCommerce Reviews plugin by Wiremo". 3. Once you found it press "Install Now" and proceed. 4. Once it installed press Activate button. 5. Now you need to connect with Wiremo. In case you already have a Wiremo account click on the "Connect your Wiremo account" button. If you don't have an account press on the "Create Wiremo account" button. 6. For those who choose to create a Wiremo account follow the next steps. Please make sure all inputs are filled out properly. In case everything is ok please press the "Yes, use this details" button. You'll bee connected with Wiremo automatically. If there are some details that would like to change press on the "No, I would like to change" button. Then update your details and press the "Sign in" button. 7. For those who already have a Wiremo account and try to connect, in the opened pop-up window enter your Wiremo Dashboard email and password and click login. Then wait until it's loaded. Note:Please make sure that pop-ups are allowed. In case your Popup Blocker is enabled you'll get a notification as it is shown in the image below. Please add Wiremo to your exception list and repeat the connection process. Disable WooCommerce native reviews (pin 1) - In case you were using WooCommerce native reviews, this will disable them. 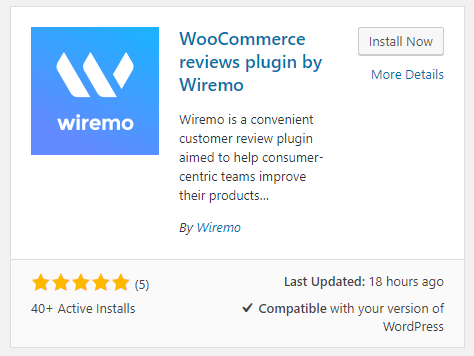 Enable Wiremo reviews (pin 2) - this will enable Wiremo on your website, so you could start getting and showing reviews. Reviews location to set it at Tab or Footer (pin 3) - there are two possibilities to show Wiremo widget in the single product page. You can place it on the same page below the description or create a separate tab for it. All other settings are optional. You can start with customizing your Wiremo plugin. Show stars on homepage (pin 5) - this will enable rating stars for your products on the homepage so you can show them from the beginning. Show stars in category page (pin 6) - same as for home page you can show rating stars for your products in the category pages. 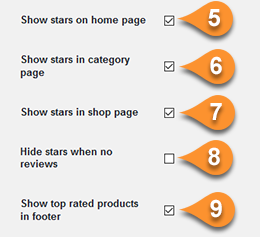 Show stars in shop page (pin 7) - this option will show rating stars of the current product, below the product name. Hide stars when no reviews (pin 8) - hide rating start for the products with no reviews. 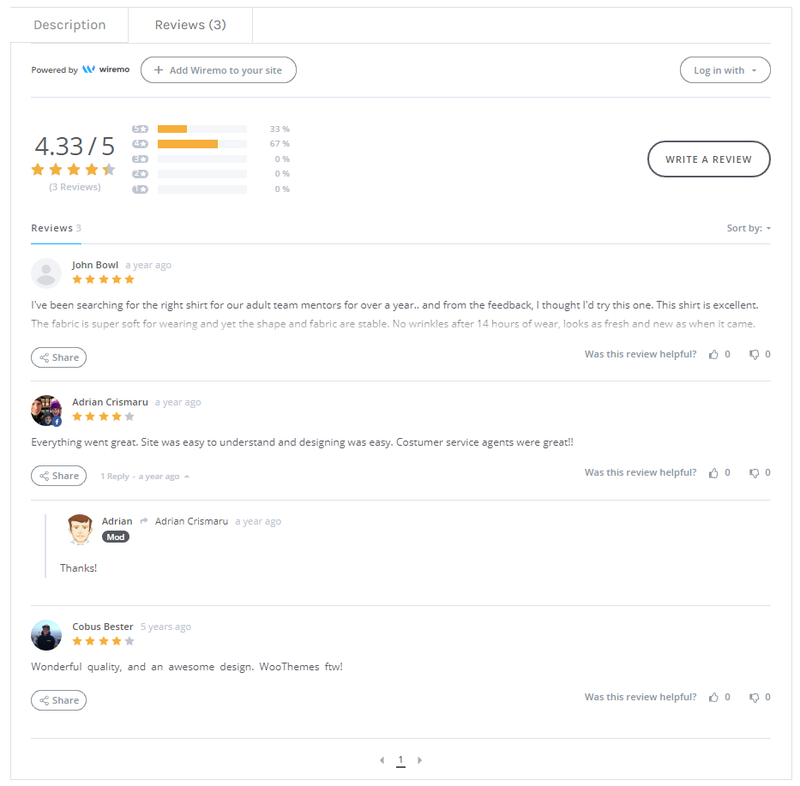 Show top rated products in footer (pin 9) - a cool feature that will show other top rated products from your shop, below the description or reviews in case you don't have a reviews tab. Custom text for top rated products (pin 10) - you can edit the title for the top rated products section. Sort related products by average rating (pin 11) - this option will sort products by average rating in the top rated product section. Automatic authentication for customers (pin 12) - a very useful option. By enabling it, your customers won't need to authenticate their review. Our plugin will use your customers WooCommerce details - first name, last name and email. Sync Wiremo with WordPress (use once) - Use this button only if you disabled/enabled Wiremo plugin. This function is used to synchronize reviews statistics with your website (pin13). 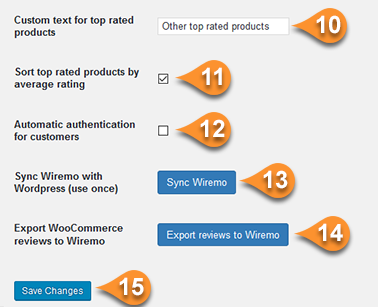 Export WooCommerce reviews to Wiremo - In case you already have customer reviews you can export your existing reviews to Wiremo by clicking on the button "Export reviews to Wiremo" (pin 14). This will export all your reviews and admin replies. Note:To customize your Wiremo widget and make it look same as your website design just follow up our tutorial: How to customize Wiremo widget? 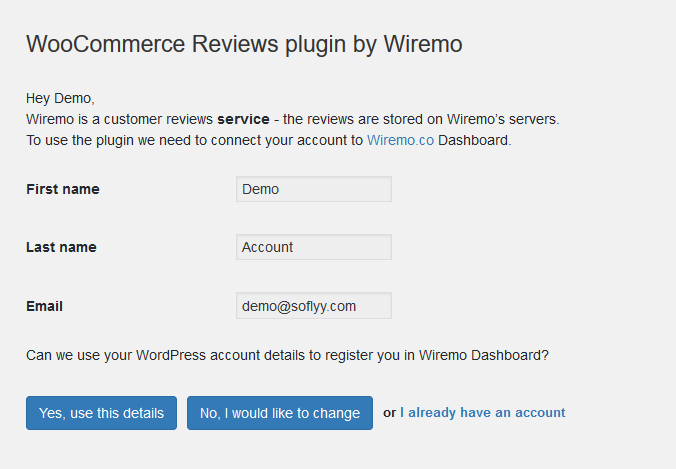 To setup and enable Automated Review Request in Wiremo plugin for WooCommerce please follow this tutorial: How to setup Automated Review Request in WooCommerce plugin. To setup and enable Past Orders Review Request in Wiremo plugin for WooCommerce please follow this tutorial: How to setup Past Orders Review Request in WooCommerce plugin.